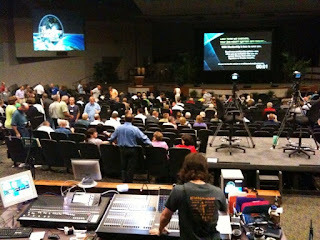 Big day at Topeka Bible Church yesterday. We had our normal 5 worship hours (3 locations), then add the Discovery Day tent, then an evening baptism at the lake with 20+ people making a public statement to follow Jesus. 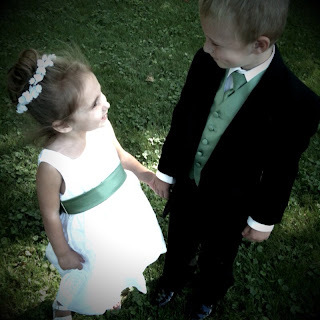 Personally, we had a wedding that our kids were flower girl and ring bearer in, so that was Thursday/Friday. It was a big week and weekend. I learned that musicians/techs function differently in the AM verses PM. Don't all of us? With a unique Saturday rehearsal, I was toast when I walked in. So were others, including the pregnant singer with morning sickness. I function better in the PM rehearsal on Thursdays. Glad that's our regular routine. Now to take care of Sunday AM...what about a Saturday PM?!?!? I'd be in heaven. Pick easy/familar songs when you have a late rehearsal (or a freak "no rehearsal" at all for some reason), that is if you are used to rehearsals advanced of Sunday. I've wondered what this senario would look like? What do you think? No rehearsal Thursday, just Saturday...then roll. 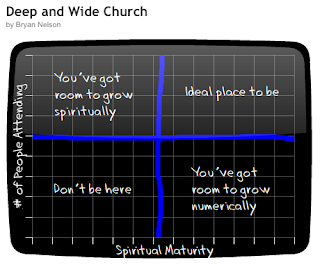 How Deep and Wide is Your Church? Exit Interview: Why are people leaving your church? What if people were leaving your church because they "never felt fed?" What if people were visiting other places to get what they felt they needed because they didn't get it at your location? What if people were just singing words instead of really meaning them during a worship gathering? What if people questioned if the majority really even had a relationship with God? What would you do? Anything? Or is it easier to turn my head? 1. Do people in our church have a relationship with God? What percentage do you think? 2. Are we sure people are growing deeper in the relationship? Where have they come from, where are they today, and where are they going on a spiritual spectrum? 3. Are we using God's Word to feed people? If not, how can we so that #1-3 happen? How do we evaluate to figure out these things? Some deep questions for this morning. We had a streamlined band this week in the Main Auditorium (MA) - Drums, Bass, Acoustic Guitar, Electric Guitar, Keyboards, and two vocalists. Downstairs in the Lower Auditorium (LA) we had about the same, add a vocalist and subtract the Electric Guitar. I'm learning that fewer instruments get in the way of each other (both musically and audio mixing), however I'd really like as many people along for the ride as possible. With the Vocal Team (all TBC singers) and Orchestra cranking up again this fall, I don't mind a smaller group here and there. One of our piano players who came to worship this past week came up to be following one of the hours. She mentioned, "I like it when you are on keyboard and leading worship - things flow from one thing to another nicely." I agree with her, but I'm in turmoil over it. I'd love to have things setup where there is flexibility between the a keyboardist and the worship leader. You know, the whole 'I'm reading your mind and I'll take you there' type of thing. However, because we are synchronizing two bands together between Main Auditorium (MA) and Lower Auditorium (LA) - there's hardly any room for flexing. About the only flex we have now is when I'm on an instrument and can add small flexibility. But this doesn't flow as nice and there's lots of down time between every song. Easy location transfer - imagine if the band wanted to travel to site #3, #4, and #5 in town with the same worship set? Easy...take the iPod with you. So at the end of the day, we are married to this out of necessity. As a result, the Main Auditorium (MA) and Lower Auditorium (LA) are able to coincide together. 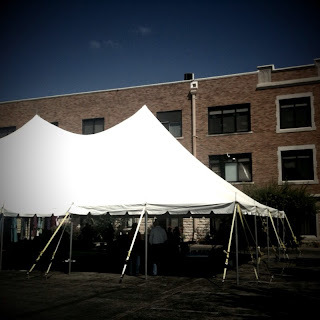 It jumps our seating capacity from about 600 to about 800 on a given hour of worship. Is it worth 200 people? Yes. Remember, we count people because people count to God. Our add-on instrument in the Main Auditorium (MA) this week was an Accordion [and piped down to our synchronized location in the Lower Auditorium (LA)]. 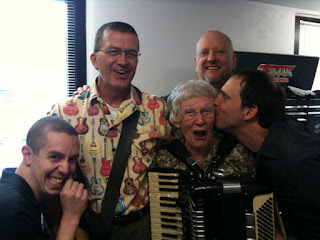 Now, don't think that accordion music is strictly for German polka worship. Emmi did a tasty job of playing with the rhythm section. It was also nice for me to hand up the guitar and play B3/keyboards for this week. Finally, the song "Hungry" is new for Topeka Bible Church. While the song is 10 years old and some of it's popularity has faded since the Passion movement, the song is new in our eyes. If you think hymns or other songs that are years old are out-dated, think again. Many older songs resonate with today...sometimes the style of music simply needs a little updating. And sometimes, they are fine all by themselves. Thank you to Wayne and New Hope for making daily readings from the Bible accessible to their church...and the world. Moving the church (people) out of the church (building). Via The Digital Sanctuary. New Hope on iPhone from Peter Thourson on Vimeo. That's Emmi Homman I'm smacking. She's a gem to work with. Thanks to Matt Ottman for finding this video and sending it to me. This is exactly the video projection stuff we were seeking for the light show. The video just keeps getting better and better the longer you watch it. This was a fairly "normal" week for us. It's nice to have a "coast" week where we can re-group and launch some creativity in the future. hire, fire, and deal with board meltdowns in this session.